Google keeps bringing in new innovations and technologies to make our life simpler. It never fails to impress us with its simple yet useful applications. From Gmail to Google Home to Google Now, they have always tried to enhance our user experience and make our everyday life easier. When Google Now was launched it was adapted by millions of users worldwide, but soon after Google Feed rolled out this change was a bit less accepted. Not many of us are aware about this but Google Feed is pretty cool, you just have to make a bunch of customizations. 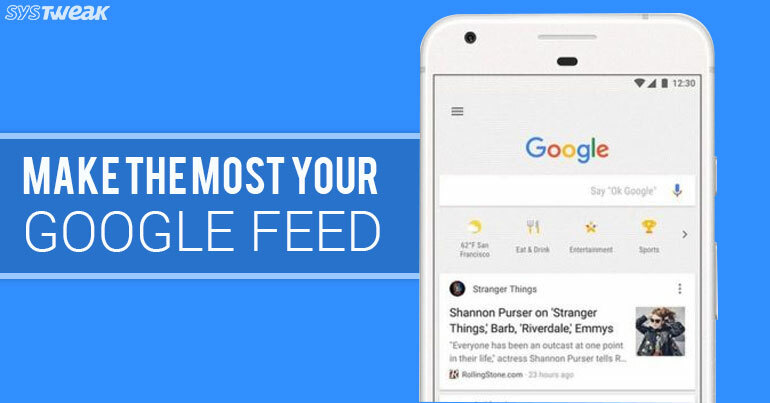 Here’s how you can access your Google feed and make it more useful. There are a couple of ways to access your Google account feed so let’s start from the basics. If you own a Pixel or Nexus device then go to the left most home screen to access Google feed. Rest of the users may directly jump to the next step. If you’re using any other device except Pixel or Nexus then first install Google app on your Smartphone. Launch the Google app to access feed. See Also: How to Hide or Unhide Photos on Google Photos. It’s pretty simple to customize your Google Feed, let’s check it out. Pixel owners can reach to the customize section by simply tapping the three dots in the upper right corner and then tap on “Customize Feed”. Other device users who are using Google app tap on the three lines icon in the top right corner and then select “Customize”. Once you arrive at the Customize Feed window, you can start adding your interests here via “Follow Topics” option. You will be redirected to a new window where a bunch of trending topics will appear on the screen. You can choose from: Sports, TV, Movies, Musicians, etc. Tap on one of them to get started. Google also displays a bunch of relevant suggestions on the Feed page which mostly includes popular stuff or nearby events. Tap on the small plus icon next to the suggestion which you want to add in your daily feed. You can do this for all your favorite stuff in every category! You can also tap the magnifying glass in the top right corner, to search for a specific topic of your interest. Once the relevant topic appears on the screen, then tap the plus icon to add it to your Google account feed interest list. To save the settings, tap on “Done”. If anytime you feel like viewing the topics which you follow, scroll through the Customize feed page to have a quick overview of your account. Take some time and start exploring your favorite topics. The more you’ll explore, the better Google Feed you will get! Well, once you’ll customize your Feed as per you liking you will surely start accessing it a dozen times of day. So, customize your Google Feed to make the most of your device and to keep in pace with latest news and events. It really is the best of both worlds once you build it up for yourself!